On the night of Feb. 11, 1967, hundreds — maybe thousands — of people congregated in the international terminal of Kennedy Airport, not to embark on flights to far-flung places but rather, well, it isn’t entirely clear or relevant. The gathering was an impromptu party, a nonpolitical demonstration, a happening named, in the spirit of the times, a fly-in. Now we might be inclined to see it as a prehistoric flash mob, an example of the power of communication technology to create instantaneous, ephemeral but nonetheless meaningful communities. Bob Fass, of WBAI, in “Radio Unnameable,” about his career as a pioneer of free-form radio. 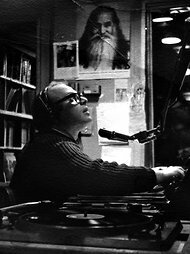 The medium in this case was radio, and the brains behind the fly-in — though he modestly described himself as a humble “neuron” — was Bob Fass, a late-night host on WBAI-FM (99.5) in New York. Mr. Fass, whose sonorous baritone still can be heard on the station, offering provocation and comfort to insomniacs and late-shift workers, is the subject of “Radio Unnameable,” a new documentary by Paul Lovelace and Jessica Wolfson. Drawing on archival photographs and audiotape, the filmmakers pay tribute both to an influential voice in broadcasting and to the times whose ideals and follies he helped articulate. Robin Williams used to joke that if you remember the ’60s, you weren’t there. That may be so, but Mr. Lovelace and Ms. Wolfson assemble a motley, graying assortment of characters who seem to have forgotten nothing. Mr. Fass narrates old war (and antiwar) stories with vivid clarity and impeccable timing, and his accounts are fleshed out by a Greek chorus of friends, co-workers and fellow travelers. These include the singers Judy Collins and Arlo Guthrie; Mr. Fass’s current and former wives; WBAI staff members: and pillars of countercultural mischief like Wavy Gravy, Ed Sanders and Paul Krassner. The case they make for Mr. Fass’s importance does not seem overstated. WBAI’s eccentric millionaire owner, Louis Schweitzer, donated it in 1959 to the Pacifica Foundation, a nonprofit operator of listener-supported stations, so that it would not broadcast commercials. It was (and remains) an oasis of nonconformity in a slick and standardized medium. Mr. Fass, working after midnight, was a pioneer in free-form radio, using his airtime to improvise a collage of music, ideas and meandering conversation. The fly-in was an experiment meant to test not only his persuasive powers, but also, more vitally, his intuition that his isolated listeners might constitute an invisible tribe. Or a social network, if you prefer. Or even a movement. The giddy hedonism of the airport caper mutated into something more serious. When a woman in Greenwich Village told Mr. Fass, on the air, of having been displaced by a fire, listeners called in with offers of shelter and assistance. During a sanitation strike, Mr. Fass mobilized his audience into volunteer cleanup crews. And as opposition to the Vietnam War heated up, his broadcast became a hub of organizing as well as a source of firsthand news reporting. The Yippie leader Abbie Hoffman called in with news of the Chicago Seven conspiracy trial that followed the riots at the 1968 Democratic National Convention. “Radio Unnameable” is most memorable as a chronicle of those days, adding new details and dimensions to a well-known, myth-smeared story. But the film also tells a more complicated, less heady story of post-’60s sectarianism and drift. One ambition of the supposedly revolutionary New Left often seemed to be little more than putting a different, younger group of white men in charge of things. But the social movements that followed — feminism, gay liberation, post-civil rights multiculturalism — challenged this view. At WBAI in the ’70s, things got very messy. There was a coup, a strike and an occupation, and Mr. Fass was taken from the studio in handcuffs. He returned, of course, and is still fighting. He and his old friends try to nudge the movie toward present-day relevance, and it is certainly possible to see premonitions of Occupy Wall Street in some of the Yippie actions of yesteryear. But the charm of “Radio Unnameable” is, finally, elegiac. It can make you wish — or, if you’re lucky, remember — that you were a sleepless New Yorker in 1967, kept from loneliness by a gentle, soulful voice on the radio.